The Samford University Tuba/Euphonium Ensemble has been invited to perform at the 2015 United States Army Band Tuba and Euphonium Conference in Washington, D.C. The ensemble performs Jan. 30 at 3:30 p.m. CST. The performance will be broadcast live via YouTube. 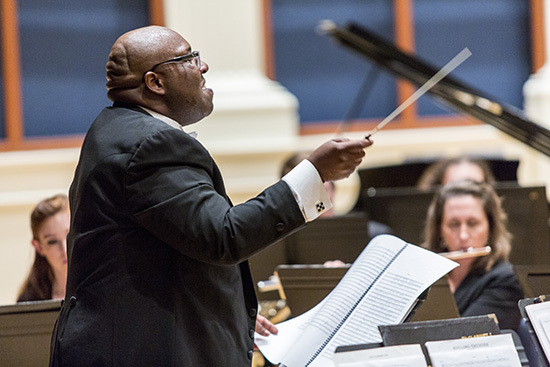 Demondrae Thurman, associate professor of music, will conduct the ensemble of seven students: Conrad Shaw, Max Benedict, Hoyt Sims, Caleb Cranton, Tom Yan, Doug Barr and Jalen Morgan. Dr. Thurman is looking forward to the performance and believes that the event will not only be a great opportunity for the Tuba/Euphonium Ensemble, but will also be an opportunity for Samford. Thurman and pianist Kathryn Fouse, associate dean for music in Samford’s School of the Arts, will give a recital during the conference. Their performances can also be viewed live.